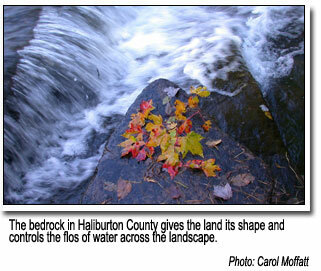 Haliburton County boasts about 600 lakes, numerous streams and rivers, and countless wetlands. This abundance of water and how it flows across the landscape are explained by the character of the bedrock found in this area. The rock you see here is mostly metamorphic rock called gneiss (pronounced “nice”), which makes up most of the Canadian Shield. With respect to the flow of water, it is important to note that there is almost no open space within the structure of this type of rock – less than 0.01%! 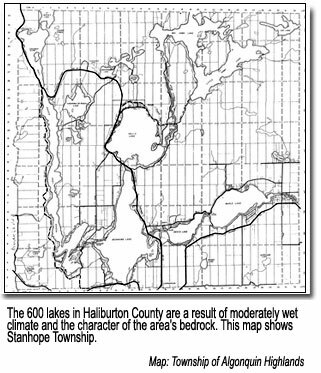 As a result, very little surface water in the Haliburton Highlands seeps down into the bedrock. The well-sealed bedrock bottoms of our lakes and wetlands, keeps the water on the surface instead of allowing it to drain downward. The bedrock in the Haliburton Highlands is made even more significant by the thin soil cover. Where soil exists at all, it consists of only a very shallow layer on top of the bedrock. Therefore the shape of the landscape here is determined not by mounds of soil, as in other areas, but by the bedrock beneath it. How water makes its way downstream — its flow and speed, as well as the shape of lake basins — are all controlled by the same bedrock topography. 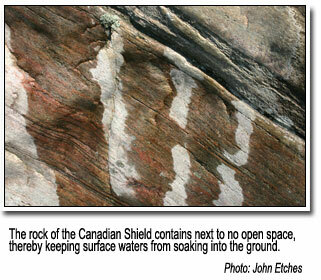 An example of how the bedrock controls the flow of water lies before you. The well-defined valley occupied by the log chute and the Kennisis River was created by two geological events: faults and glaciers. Faults appeared hundreds of millions of years ago in places where the Earth’s crust cracked and then shifted. As the rock along fault lines moved, it was subjected to a lot of grinding and crushing. As a result, the rock along many fault lines lost its strength and competence and, in many cases, is now broken and jumbled compared to the surrounding rock outside the fault zone. But how do faults affect the present day landscape? The answer lies with the second event: glaciers. It is thought that between about 78,000 and 10,000 years ago, most of Canada was covered in up to three kilometres of ice. As this continental glacier ripped and scraped across the landscape, faults became exposed and the glaciers were able to dig deep into the splintered rock along the faults. They removed the fractured, faulted rock and left behind the stronger, unbroken rock. This is how the Kennisis River valley in front of you came to be. The fault along the Kennisis River valley is lined up with the north-south direction of glacial movement. This alignment allowed the glacier to dig out the faulted rock with great efficiency. The result is this steep-sided gorge. Much of the topographic variation in Haliburton County can be attributed to the interplay between the glaciers and the broken rock along faults. The resulting cliffs, valleys and soaring uplands throughout Haliburton County presented loggers with great challenges. However, it is also the unique features of the landscape that gave them the vast waterways so desirable for moving timber downstream and sparked the need for inventions like log chutes.